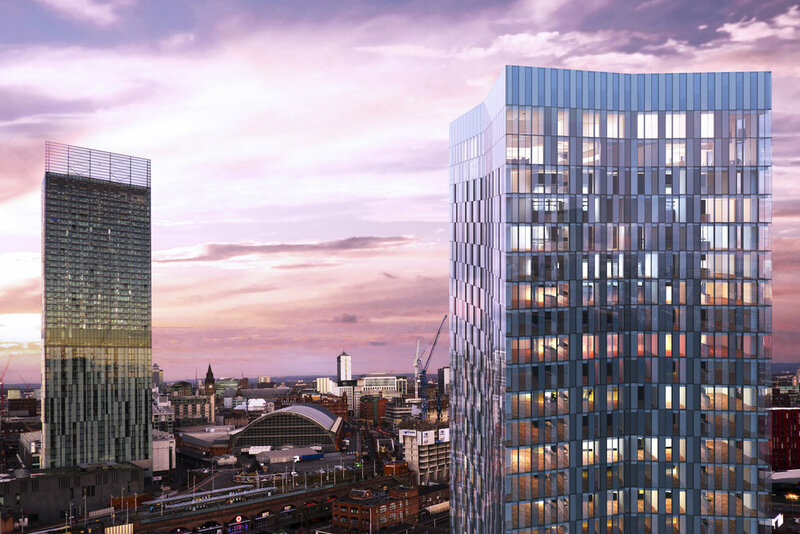 Deansgate Square is a groundbreaking development bringing new levels of sophistication to the heart of the city centre. Four sleek glazed towers will reach as high as 64 storeys, providing 1508 luxury apartments and exclusive penthouses, some featuring private winter gardens. The scheme will incorporate high end residents’ facilities including 25m swimming pool, indoor tennis court, 1,900 sq ft gymnasium, Leisure Suite, dedicated resident’s lounges and relaxation areas. There will also be a “Residents Only” rooftop garden with private bar and catering facilities. Deansgate Square will be the single most high profile residential-led development the city has seen to date and will incorporate 2.7 acres of imaginative public realm including a new riverside plaza. Renaker are working in partnership with Simpson Haugh Architects, designers of some of the UK’s most iconic residential developments. Construction is well underway with the first tower due for completion in Spring 2019. Further information can be found at www.deansgatesquare.com. To register your interest please email sales@renakerbuild.com.